On July 16, 1845, board commissioners met at the home of Webster Stanley where Robert Grignon presented a proposition from Augustin Grignon for locating the county seat at Butte des Morts..
Grignon’s proposition was that his uncle Augustin Grignon, would donate the land where the county seat would reside. Two other proposals were presented. The board considered all three offers and adjourned until July 31, 1845. The decision was made to locate the seat of justice on Butte des Morts land offered by Grignon. The land was deeded to the county in October 1845. In 1847 the seat of government was moved to Oshkosh. 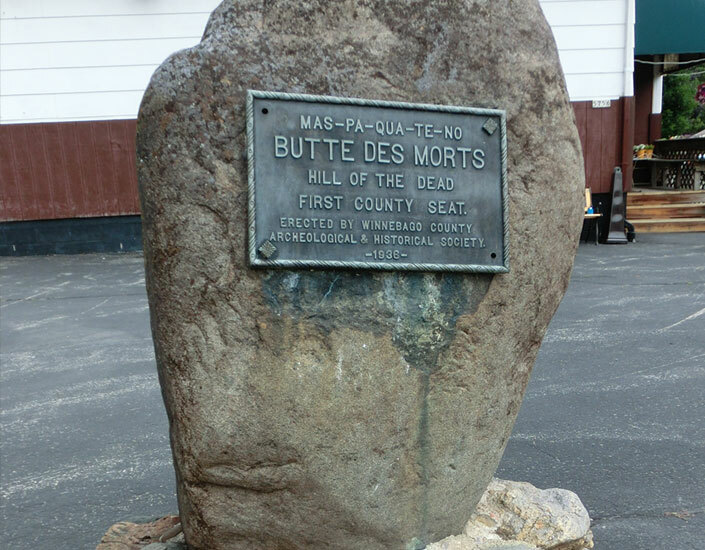 In 1849 a movement was started to relocate the county seat back to Butte des Morts. Debates became bitter and personal; petitions opposing the move to Oshkosh were signed, bearing over 500 signatures. On April 2, 1850, an election was held in the county for and against the removal of the county seat from Oshkosh to Butte des Morts. The vote tallys were 472 for removal and 690 against. Oshkosh officially remained the county seat of Winnebago County. (Source: Oshkosh Daily Northwestern March 5, 1955).